Online registration OPENS March 1, 2019 at 12:00:01 a.m.
Online registration CLOSES May 11, 2019 at 11:59:59 p.m.
Marathon Start Line, Oak Spring Road, Libertyville until 9:30 a.m.
Minithon Start Line, Potawatomi Woods, Wheeling, until 11:30 a.m. Early bird Special: March 1 through April 22, 2019, (Earth Day). Early bird fees are $25 per paddler and $5 for each passenger from March 1 through April 22. Note: two-paddler teams in the Minithon and No Contest classes only may carry up to two passengers. Entry fees increase to $30.00 per paddler, April 23 thru May 11, 2019. Passenger fees in the Minithon and No Contest classes remain at $5 per passenger. Pre-registration deadline: Saturday, May 11, 2019 at Midnight. Race Day registration fees are $35 per paddler, $5 per passenger, by check or cash only. Registration is limited to the first 1000 craft. You are not guaranteed registration on Race Day. Don't forget to pick up this year's collectable patch at the Finish Line area! A tradition for both the Des Plaines River Marathon and the Minithon. T-shirt: $7 pre-paid in advance at time of online or mail-in registration. T-shirt can be picked up at Finish Line. Participants who register the day of the event are not guaranteed a collectible patch or t-shirt. If extras are available, a free patch may be picked up at the Finish Line and a t-shirt may be purchased for $10, sizes not guaranteed. Participants need to be aware that this is an outdoor event, and that we have no control over weather and related conditions. Nor can we patrol at every point along the river. Paddlers and passengers inevitably, therefore, take on personal risk and personal responsibility by participating. The organizers do all they can to make the Marathon and Minithon as safe as possible. The threat or occurrence of extreme weather or other emergency may cause the event to be interrupted or cancelled. Read about this, safety information and event rules at this link: Safety/Rules. Any participant who violates the event’s rules and regulations as set forth on this website will be subject to disqualification at the discretion of the race officials. All participants and passengers must be registered and sign an official waiver of liability. No participant’s entry will be accepted without a signed waiver form. - 9:30 a.m. for the Marathon, Oak Spring Road, Libertyville. - 10:30 to noon for the Minithon, Potawatomi Woods, Wheeling. A table of boat numbers and planned starting times may be consulted at Start Times. The online registration process provides a request check box for teams indicating their wish to paddle in the same heat. If registering by mail, teams wishing to race as a group must send their entry forms in the same envelope. No email or internet access? For registrants lacking email and internet access, paper applications may be obtained by leaving a message on the Marathon Hotline: 847-604-2445 after March 1, 2019. 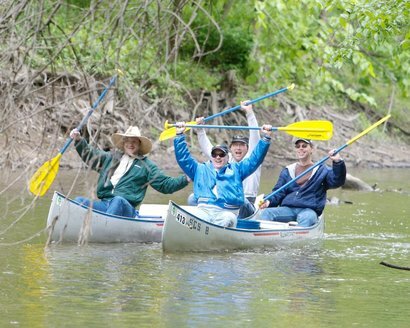 Open Class boats with more than 2 paddlers, maximum of 4.
message on the Marathon Hotline: 847-604- 2445 after March 1, 2019.